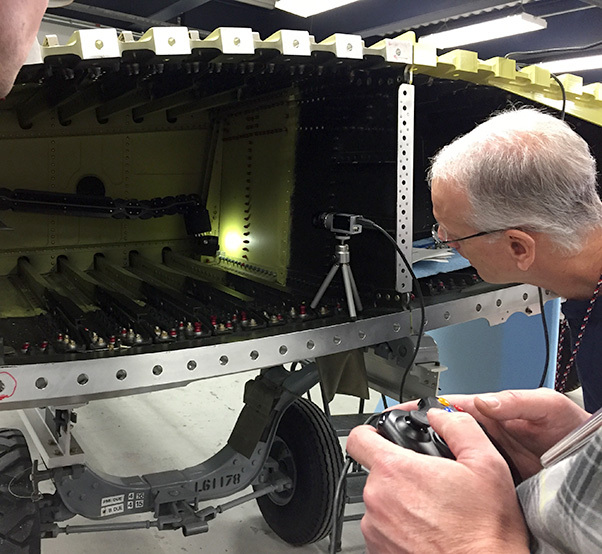 The Remote Access Nondestructive Evaluation Snake arm system is shown inspecting fasteners during a recent demonstration at Hill Air Force Base, Utah. A common problem for aircraft maintainers may soon be a thing of the past, thanks to an Air Force Research Laboratory advanced inspection robotics research effort. AFRL researchers recently traveled to Hill Air Force Base, Utah, to demonstrate the Remote Access Nondestructive Evaluation (RANDE) system. Developed through a contracted effort with OC Robotics of Bristol, United Kingdom, RANDE is a flexible, robotic snake-arm tool that can reach into confined areas to perform required inspections, or simply look into tight spaces. 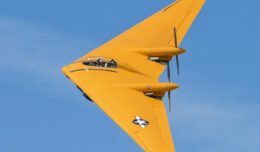 Typically, when military depot or field personnel perform routine inspections on hard-to-reach components such as the interior of aircraft wings, they first have to remove the wing, then remove additional structure within the wing so that inspectors can reach in with specialized equipment. With RANDE, the need to remove the wing for inspection can be eliminated. Instead, maintainers only need to remove the necessary external access panels and maneuver the snake arm through an access hole as small as three inches in diameter. This simplified process results in reduced maintenance hours — due to quicker inspection preparation — and eliminates the possibility of maintenance-induced damage from the pre-inspection processes. At the end of the snake arm is a multi-axis maneuverable head that includes multiple lights, small cameras, and a port to which inspectors can easily attach a variety of interchangeable nondestructive inspection tools, including eddy current probes. The system is easily portable and can be wheeled to the inspection area for quick setup and use. A laptop computer records the full robotic motion, video camera images, and inspection data; as the robotic arm is easily maneuvered with the use of a familiar joystick game controller. 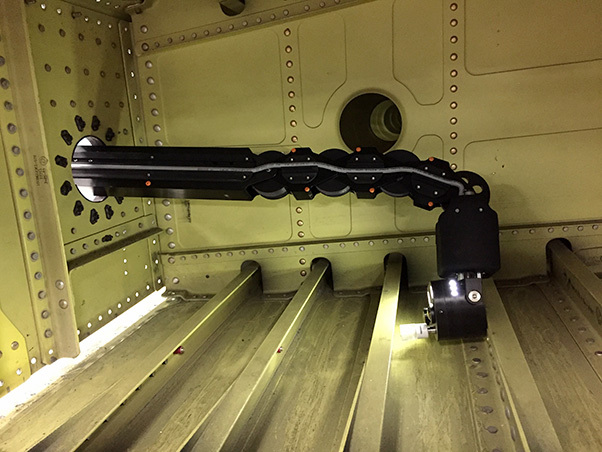 In January, AFRL demonstrated the RANDE Snake Arm tool at Hill AFB to engineers in the NDI laboratory and wing shop, allowing them to experience its capabilities, range of motion, and ease of operation. RANDE is poised to become an important tool for maintainers performing nondestructive eddy current testing. The testing method, which employs the principle of electromagnetic induction to detect flaws in materials, is one of the most effective means by which inspectors can assess the state of aircraft structural materials. Typically, inspectors manually run handheld eddy current probes over a material surface to search for defects or surface cracks. However, these handheld inspection probes can be tedious to use, and the inspections subject to human factors. When used with conformal eddy current probes developed in an earlier AFRL program, RANDE fully automates the positioning and surface contact, increasing the inspection reliability and probability of detection. Jay Nielsen, of the 809th Maintenance Support Squadron, observes the snake arm motion of the Remote Access Nondestructive Evaluation tool during a recent demonstration at Hill Air Force Base, Utah. RANDE can be used in many hard-to-reach spaces and can be fitted with a variety of probes to inspect flat areas as well as raised head fasteners and edges, comparable to traditional eddy current inspection procedures. “With RANDE, we’re offering a new and better depot and deployable field solution to the NDI engineers and inspectors that we depend upon so heavily to keep our aircraft safe and in service. This capability will enable them to look forward with labor- and cost-efficient possibilities in their toolbox” said Charles Buynak, the AFRL Materials and Manufacturing Directorate senior program manager. In addition to reducing the time required to complete inspections, RANDE greatly reduces labor and aircraft downtime, which equates to substantial cost savings. Additionally, due to decreased aircraft disassembly needs, potential aircraft damage is reduced. Maintainer health and safety is also increased since inspections no longer require climbing onto an aircraft or wedging into tight spaces. Following the successful demonstration at Hill AFB, the RANDE Snake Arm system will be closely examined by the 809th Maintenance Support Squadron engineering staff to gain experience with the snake arm system and identify its breadth of application for access-challenged inspections across various weapon systems.